The CTE Chorale under the baton of Ms Felipe made a rendition of the song Amianan. This was performed during the launch of the Center for Ilocano-Amianan Studies at the University Library of the Mariano Marcos State University in Batac, Ilocos Norte. 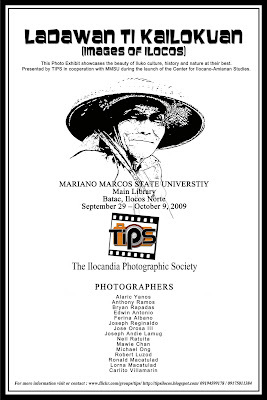 The Ilocandia Photographic Society (TIPS) is holding a photo exhibit entitled “Ladawan ti Kailokuan” (Images of Ilocos) upon the invitation of the Mariano Marcos State University (MMSU) in Batac, Ilocos Norte during the launch of the Center for Ilocano-Amianan Studies on September 29, 2009 at the University Library. The exhibit runs until October 9, 2009. This project aims to promote the Ilocano culture and heritage. The exhibit showcases the beauty of Iloku culure, history and nature at their best. Photograps composed of the world heritage Paoay Church, Vigan Heritage Village, Bantay bridge, Pangil Rocks in Currimao, Pagudpud Beach, Guling-guling Festival, and many others. My photos on exhibit were Daklis, Dapil, Kalap, and other Tagnawa photos. University President Miriam Pascua cut the ceremonial ribbon to signify the opening of the photo exhibit to the public. It was attended by students, faculty members and administrative staff of the university, delegation from Ilocos Norte National High School – School for the Arts, Northern Christian College, Ilocano writers from Gumil and Bannawag and other guests. It was followed by rendition of cultural performances such as kanta, dueto, dallot, suelto, daniw by select students and faculty. Messages were heard from the Dr. Pascua and Dr Alegria Visaya. Finally I got hold of my brand new passport last Friday. I traveled again back to Manila to pick it up after 10 working days from my application. I just made an appointment on the website of Foreign Affairs Department at www.dfa.gov.ph. They replied with the schedule after a day or so. I printed out their email and brought along my old passport. One doesn’t need to queue, but go directly to gate 3 at the counter in charge of the e-passport. I paid P950 for the 44-page passport and submitted myself for the biometrics. It’s a brand new passport because its now maroon passport and yet it’s electronic. This will make the country at par with developed countries. Bye now to the old green passport. The e-passport has a microchip. It’s also called a biometric passport since it will require photograph for facial recognition, finger scanning for fingerprint recognition, retinal scan for iris recognition and the digital signature of the applicant. This is a modern technology to authenticate the identity of travelers. It uses a contactless smart card technology with the computer chip and antenna embedded either in front, center or back page of the passport. This is being used by the International Civil Aviation Organization for documentation. The said chip can easily be read by border control officials in other countries using passport chip reader. 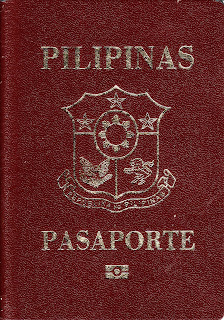 On August 11, 2009, the first biometric passport was released for President Gloria Arroyo with serial number EA0000001 while I was given the 246th e-passport in the Philippines. I am happy to have it because I can fly again to the exciting destinations of the world. The commemoration of Marcos Day was held today at the town of Sarrat. 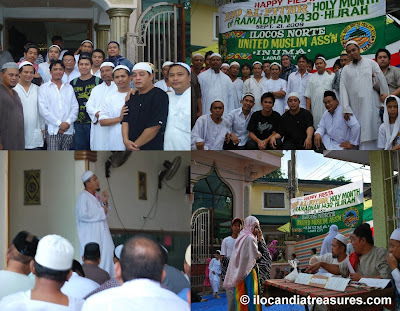 This is the first time it was held there as it had been previously in Laoag or Batac. This is the 92nd Birth Anniversary of the late President Ferdinand Edralin Marcos whom the people of Ilocos Norte consider as the illustrious son. 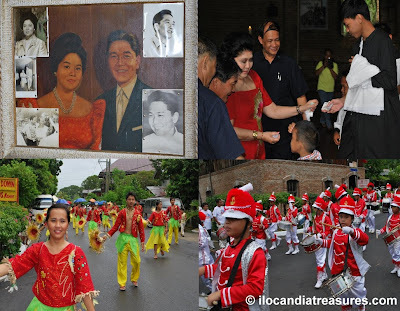 Sarrat is the birthplace of Marcos and their family house was converted now into a museum. Ferdinand Marcos was born on September 11, 1917 who became the 10th President of the Philippines. He was a lawyer and a war veteran. He became a member of the Philippine House of Representatives and the Philippine Senate. He had served the country the longest time for 20 years and was ousted from office by the People Power Revolution in 1986 due to corruption and dictatorship as he imposed Martial Law in 1972. He was exiled in Hawaii and died there of an illness on September 28, 1989 and reported that his body still lies at the Marcos Mausoleum in Batac. Even though it was raining, my colleague Alaric and I braved it and covered the event. We started at the Santa Monica Church where a Mass was celebrated. We had seen the entire family composed of the children, Imee Marcos, Irene Marcos-Araneta, Congressman Bongbong Marcos, who even celebrated his birthday today, and the widow, former First Lady Imelda Marcos. We have seen her giving cash gift to the group of sacristans at the church. Later, a parade was held where each town’s delegation participated in. There were a few floats seen and a dance parade by a group of young local dancers depicting an occupational dance of planting tomatoes. There were speeches delivered by Mayor Balintona and Governor Michael Marcos Keon and they remembered the life and legacy of Ferdinand Marcos. Two years ago, my mom and I went to Taiwan for a short visit. I was able to get a promotional fare from Cebu Pacific airlines. We applied for a visit visa to Taiwan embassy from which we did not have to personally appear. I asked a friend to submit our documents on our behalf. We were given 14 days but we only spent 4 days. We landed at Taiwan Taoyuan International Airport and took a one hour bus trip to Taipei downtown where my sister-in-law Myrna met us. We checked in at a family hostel and rested for a while and got started with our stroll. 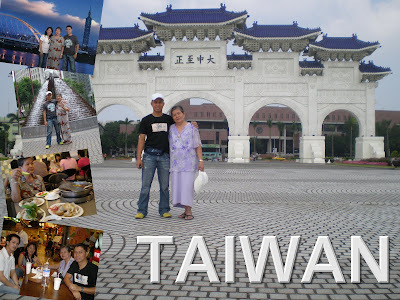 Taiwan is an island group that is governed by the Republic of China. Its former name called Formosa is a Portuguese name. Formosa literally means beautiful island. Its capital is the city of Taipei. Taiwan is being claimed by the People’s Republic of China since it was established in 1949 in the mainland and considers itself as the successor state of ROC. We visited the landmark of Taiwan that is the National Chiang Kai-shek Memorial Hall. This a monument erected in honor of the former President of the Republic of China. This is surrounded by parks, a ceremonial gateway and the statue of President Chiang Kai-shek. Then later we went for a spa and jacussi at JJ sports center just across Chang Kai Shek. Everyone was required to wear bathing cap when using the pool. There is also a gym, courts and a Seattle coffee store here. We were refreshed after the dip. We went around Ximending downtown for shopping some souvenirs. For lunch, we went to MK Restaurant for that sumptuous and popular shabu-shabu where we enjoyed it so much. There was a wide array of choices of meats, seafoods and vegetables. There were a lot of customers in this resto. Da’an Park is a forest park and went around this area. 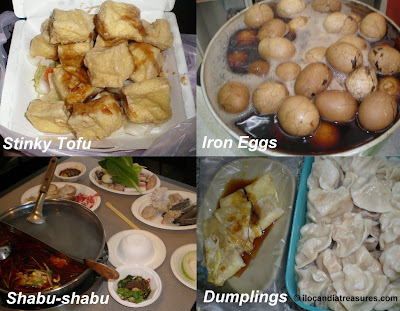 We bought some food with us such as the glutinous rice tamales with meat and other fillings and the notorious stinky tofu which I learned to love because it was yummy despite its smell. We also tried the popular drink pearl milk tea or bubble tea which was made with flour balls and aromatic milk tea. This is a unique Taiwan invention now available anywhere else in the world. We met up with my brother-in-law Nestor at the Taipei Railway Station and treated us for lunch at Shinoya Restaurant. A visit to Taipei 101 was the highlight of our trip. My mom was reluctant to get up to the observatory but I was able to convince her to see what was up there. Later that day we had a dinner of cow viscera soup and noodles at the market and a friend gifted us with mooncake, a traditional food served during the mid-autumn festival. In one night of my stay in Costa Rica nearing the day of my journey to Peru, my friend Maria and her family made fun of me. They let me wore the traditional Peruvian costume with poncho and chullo and handed to me the Peru flag and llama-like stuff toy and the photo of Angel. To play the traditional music of Peru, they gave me the traditional Andean panpipe or called siku or zamponia for its Spanish term. This is typically made of bamboo. This comes in different sizes where the longest is 4 feet. The Siku uses a diatonic scale and it is a main instrument for the music genre Sikuri. I totally didn’t have the idea on how to play it, Maria just played a CD on the player and the beautiful music was heard. I just did some lip-synching that nearly looked like I was playing it. I even danced to the beat of the music of the CD and everyone of them was laughing and enjoying the music. During my stay in Costa Rica, I was brought by my friend Maria to a cultural park where the popular band Malpais had a great concert performance. One of the members of the group, Manuel Obregon played the marimba. Marimba is a musical instrument. It belongs to the percussion family. It is made of keys or bars that were arranged just like the pianos. The keys are usually being struck with a mallet to produce musical tones. Traditionally, it is made of rosewood such as the one used by Manuel. The group really rendered a superb performance where the audience was ecstaic, rousing wuth joy. Aside from the great performance, I was fascinated by the cool and beautiful sound of the marimba that made the performance even better. This instrument originated in Africa and was brought to South America in the 16th century. The African music sound was incorporated but was changed by the music of the local Latin American culture. This is a festival celebrated by the town of Paoay in Ilocos Norte. This town is popularly known for weaving the Iloco textile called “abel.” The main raw material for abel is the cotton. With the process of manufacturing this cloth, they are required at the initial stage to employ the use of two 18-inch long sturdy bamboo sticks called batbat to beat the cotton pods and later separate the seeds from the fluff. 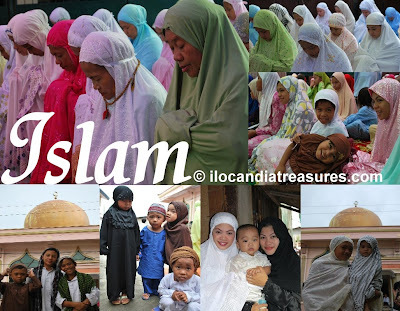 Binatbatan is the beating process. This is the first method of making the woven cloth abel. Binatbatan festival originally has its roots from this historic town of Paoay and replicated by the City of Vigan because they also weave abel. Binatbatan became another Ilocano folk dance or an occupational dance. Performers of this dance maneuver in and out of the parallel sticks and the resulting rhythm and speed of the beating of sticks made a colorful and lively display. The celebration of this festival has the main objective of promoting and preserving the livelihood or industry of the local fabric. I witnessed a showcase of Binatbatan by the Paoay locals in their participation in the recently held Pamulinawen Festival in Laoag City where they depicted the stages of making Iluko abel from beating the cotton pods to producing thread or yarn up to its end product abel.